Brad Tries Flaming Brian's Kitchen: LIVE From Wizard World Chicago! Brad and fans take shots of a little something called PAIN 100%! This is why hot sauce should only be left to the professionals like Flaming Brian. Flaming Brian's Kitchen: LIVE from Wizard World! Hot sauce goes crystal clear, as Flaming Brian and fans have a taste of Panola Clearly Hot Sauce! 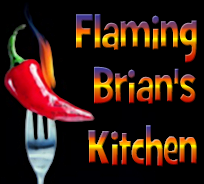 Regular episodes from "Flaming Brian's Kitchen"!